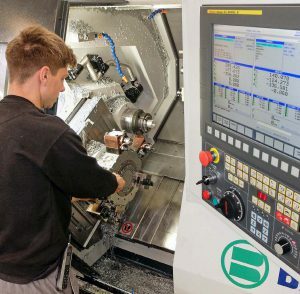 At the Hailsham, East Sussex factory of subcontract machinists, Dicker Precision Components, an Italian built Biglia twin-turret, twin spindle CNC turning centre supplied by Whitehouse Machine Tools has streamlined the production of a family of aluminium switch cover assemblies. The savings are so great that the cycle time for producing one part of the assembly has been halved while the other part is produced in a little over one third of the time. 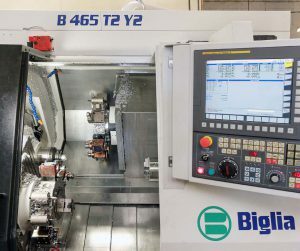 One reason for such substantial reductions is the provision on the Biglia B465- T2Y2 lathe of a second live turret with Y-axis, whereas the machine previously employed only had one. The second turret is able to operate at either spindle and allows balanced machining operations at one side or simultaneous cutting at both spindles. A generous maximum driven tool speed on the Italian machine of 12,000 rpm, three times higher than on its predecessor, is a further factor contributing to raised output. Not only does it increase productivity per se, but it also reduces the breakage of tools. Lee Chapman, shop floor manager at Dicker Precision said, “Modern cutting tools benefit from elevated machining speeds, whereas they suffer if they run too slowly. “In particular, when profiling the outside of the assembly components, our rippers and end mills used to break frequently on the previous lathe. One or two tools would have to be replaced every day. Unlike with the former lathe, he is confident of leaving the Biglia operating unattended. So it runs overnight, seven days a week, and all parts are in tolerance the following morning. The required ± 25 µm on some dimensions is held with ease and once the B465-T2Y2 is set it hardly moves, so it is rarely necessary to change the offsets. The family of switch covers comprises eight variants . Parts range in thickness from 6 to 10 mm and all are machined from 50 mm diameter aluminium stock fed from a Hydrafeed MSV65 short bar magazine. The tools required to machine all of the component varieties are resident in the two 12-station turrets, so to complete the daily changeover to the next batch run, just the program has to be called up. Each assembly comprises a base and a cover. The former requires only a single turret to complete 2 the machining cycle. So the halving of the time taken to complete it to two minutes is due solely to the higher spindle speeds and the consequent ability to increase feed rates without risking tool breakage. The cover, on the other hand, does benefit from twin-turret operation in addition to the advantages of the higher speeds and feeds. Synchronous transfer of the component after parting-off to the second spindle enables simultaneous machining of the reverse face of one component and the front of the next, resulting in a cycle time of two minutes instead of the previous 5.5 minutes. Extra time is saved by including in the CNC cycle a routine for deburring the periphery of the cover and spotting holes on the back face automatically, eliminating the former need to finish each component by hand. With several thousand switch cover assemblies produced every month, the overall advantages in terms of higher productivity and reduced manufacturing costs are considerable. For the first few months of operation, the B465-T2Y2 was devoted to switch cover component machining. Dicker Precision was soon well ahead of production target as a result of adopting thenew process, whereas bottlenecks were frequent before. So additional work was quickly put onto the machine, including fulfilling a contract for the production of stainless steel door lock components for vans. The work came from another Whitehouse Machine Tools’ customer in the southeast of England through the machine supplier’s local sales engineer, Mark Drummond, who happened to hear that the business was available.